The pioneers of Windham and Londonderry, NH were Scotch or Scotch-Irish, so called since the latter were people of Scottish lineage who dwelt upon Irish soil. They brought their religious institutions with them to this country and established them here: they were Presbyterians. In 1742 the general assembly of the province approved a new parish in Windham, township of Londonderry. In 1753 the first church was built on Copp’s Hill, now Cemetery on the Hill, but because parishioners wanted the church nearer the center of town, a new meeting house was built in 1798 -- the present town hall. Sunday services were held three times daily -- morning, afternoon, and evening, and a prayer service during the week. 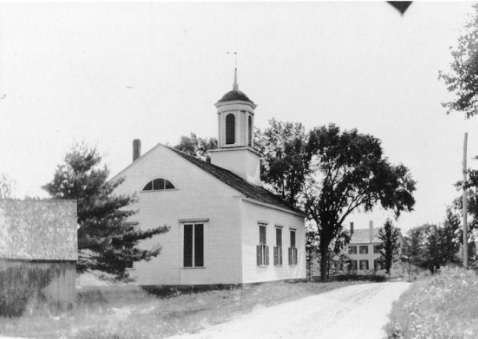 Because the town was destitute of settled ministry, preaching was provided through stated supplies until 1805 when Samuel Harris was ordained by the Londonderry Presbytery. A contention developed between the church and town over the use of the meeting house and its ministerial fund. Denied the use of the town hall for their own use, in 1834 the Presbyterians built a new church near the geographic center of town and dedicated it on January 14, 1835. The dedication sermon was preached by Rev. Calvin Cutler, who was the pastor from 1828 to 1844. The Windham Presbyterian church celebrated its 150th anniversary in 1985 commemorating the faithfulness of a loving congregation -- a faithfulness that continues into the 21st century. Quite a few changes - roads paved, carriage sheds removed, some trees cut down, shutters added, a sign board installed outside, and electricity is now available. There is still no parish hall - that won't come until many years later. see many of the original fixtures and installations put in place over one hundred and seventy-five years ago. You can't see, however, all the Faithful who traveled to church by wagon from their homes in all corners of Windham, regardless of weather, setting out for Sunday services promptly "at the ringing of the bell."